FREE download iPad Magic software at: Convert videos to iPad . Click the Video/Audio node in the left tree. Click the "Add File(s) to Device" drop-down button on the bottom, choose the "Add File(s) to List..." option, and select the files you want in the dialog that opens to add them to the list. Or choose the "Add Folder to List..." option to locate the folder you want and import all the files in the folder to the list. Check the files you want in the list, and click "Export Checked Files to Device" or "Export Checked Files to iTunes" button to copy the files into your iPad/iPhone or iTunes library. Tip: If you have connected multiple devices, then first click "Video/Audio" node and load the files you want to the list, then check the files you want to import and click the "Export Checked Files to Device" button, then the "Select Copy Destination" dialog will pop up to ask you to choose the target devices you want to copy to. Check the devices you want, and click "OK" to start importing these files to your checked devices simultaneously. More info please visit: Convert video & audio to iPad. The iPad is a tablet computer designed and developed by Apple. It is particularly marketed for ebook, magazine, and newspaper reading, as well as general internet surfing. Since its release in April 2010, Apple has sold 2 million iPads. Similar to the older (and smaller) iPod Touch and iPhone, the iPad runs a modified version of the iOS and is controlled by a multitouch display sensitive to fingertips, instead of a stylus as with earlier tablet computers. It runs iPad-specific applications as well as those written for the iPhone and iPod Touch, including e-book readers. The iPad uses Wi-Fi or a 3G data connection to browse the Internet, load and stream media, and install software. A USB cable is required to sync the iPad with iTunes on a personal computer. 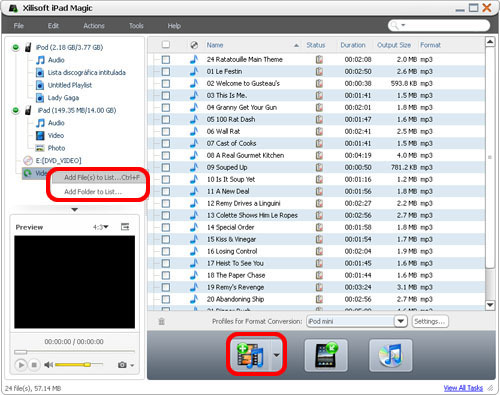 Now with iPad Magic software , you can transfer videos/music/pictures from PC to iPad without iTunes and copy iPad videos/music to your PC for backup and convert video & audios to iPad.